Martsviolerne (Sweet Violets) is among the works by Andersen that have inspired one of the truly great foreign composers outside Scandinavia, namely Robert Schumann. At the same time, Niels W Gade has set it to music, and it is interesting to see the two almost contemporary composers’ different arrangements. A point of interest here is that Schumann used a German translation, whereas Gade, in his own somewhat freer version, set the original Danish text to music. Martsviolerne was published for the first time in Andersen’s collection Digte (Poems) from January 1830, dedicated to his benefactor and father figure, a Danish civil servant named Jonas Collin. One of the persons with a knowledge of German whom Andersen came in contact with from his time at the grammar school in Elsinore, the secretary of the Swedish consultate in the town, Ludolph Schley, received a copy of this collection of poems from Collin and expressed himself most positively about them. It pleased Andersen enormously, and he wrote, “it is rather comical, that of all my poems, he almost prefers “Sweet Violets”: ‘es ist ein unendlich zartes Gedicht, wie viele Thränen mögen darauf schon gefallen seyn, und wie viele noch fallen’("It is an extremely sensitive poem, how many tears may it have caused to flow, how many more may yet flow.") he says, among other beautiful German words about it...” . The version which Robert Schumann used was translated by Adalbert von Chamisso, whom Andersen met in Berlin in 1831 and gave a copy of his Poems. Chamisso helped to introduce Andersen’s work in Germany with his poetry translations – also before the fairy tales won general acclaim. The German poet moreover himself provided texts for several of Schumann’s other songs. In addition to Martsviolerne in 1831–32, Chamisso translated three other poems by Andersen, namely “Tyveknægten” (“The Thief”), “Soldaten” (“The Soldier”) and “Spillemanden” (“The Fiddler”), and all four were published in his Gedichte von Adelbert von Chamisso in 1834. The first three poems were also printed in Morgenblatt für gebildete Stände (Morning Newspaper for Cultured Circles) in March 1833, and the dramatic poem “Der Soldat” in particular became very popular in Germany, for example to music composed by Friedrich Silcher. Andersen met Chamisso himself at the end of July 1834 and was given a copy of his collection of poems. Schumann’s Fünf Lieder für eine Singstimme und Klavier (Five Lieder for solo voice and piano accompaniment) opus 40, is from his hectic and quite sudden Liederjahr in 1840, when the majority of his best known song cycles and individual songs were composed. Prior to this time he had restricted himself almost exclusively to writing piano music, which is often also very poetic as it was inspired by poems. Nevertheless, he regarded songs as an inferior form of music. What contributed to his interest for lieder as a genre was no doubt his close association with the pianist Clara Schumann, whom he married in September 1840. He wrote the Andersen songs in July 1841 together with several other collections, shortly after completing of one of his best known lieder cycles, Dichterliebe (A Poet’s Love). This group of songs has a cyclic character, for example by beginning and ending with songs in G Major. “Sweet Violets”, however, is probably the least dramatic song in the collection, but on the other hand it conforms well to the German romantic, lyrical tradition. Schumann has written above the composition “Nicht schnell, innig” (“Not fast, sincere”) and he emphasizes his sympathy with the young man’s budding love by the rather quick rhythm and in the sighing semitone degrees of the left hand. At the same time the last sentence “Vor Herre hjælpe den unge Mand!” (“May the Lord help the young man!”) is repeated, and there is an interlude of two bars which describes the yearning caused by love, also expressed in the postlude. It was rather difficult for Schumann to get the songs printed, and after several fruitless approaches to German music publishers the music was published in September 1842 as a result of collaboration between Lose & Olsen in Copenhagen and Kistner, a music publisher in Leipzig. As a result, the songs were published with the text in both German and Danish. A second edition was also published in Copenhagen in 1854. We know that Andersen heard the songs at a private evening party at the Schumanns in Leipzig in June 1844, at which the singer Livia Frege sang them with Clara Schumann at the piano. He himself describes the performance very enthusiastically, whereas Clara Schumann rather thought that he regarded the little concert with indifference. However, the first documented public performance of “Sweet Violets” did not take place until 5th December 1868 in Vienna, when they were sung by Gustav Walter, here again with Clara Schumann at the piano. Niels W. Gade set three of Andersen’s poems to music in 1850. We cannot determine the specific reason, but Gade was very productive at this time and completed, amongst other works, his very popular 4th symphony. Having visited Leipzig in the summer, Gade was appointed conductor in the Music Society in Copenhagen in the autumnn of 1850, an activity which he continued until his death in 1890. In 1850 he moreover fell in love with J.P.E. Hartmann’s daughter Sophie which resulted in their engagement the following year. Andersen was one of the first to congratulate them. Gade’s arrangement is more flippant, with a faster tempo and a more agitated rhythm. He also expresses the prayer to help the young man in a chromatic, sighing motif, but otherwise the focus is on the interplay between the ice plants, the blue eyes and the sweet violets. By the repetition of the line “such pretty flowers he never knew, two sweet violets so deeply blue” Gade changes the second time to “two eyes so blue” where the word “blue” is given a particularly long note. In this way the composer emphasizes the playfulness of spring and the exciting depths contrasted with the fleeting nature of the ice in the girl’s eyes. The songs composed for Andersen’s texts were published in the collection Tre Digte af H.C. Andersen for én Syngestemme med Pianoforte (Three Poems by H.C. Andersen for solo voice and piano accompaniment) in Copenhagen in December 1851. “Sweet Violets” is the last of these and was thus composed considerably later than Schumann’s version. The three songs must have been popular, because Hornemann and Erslev were able to publish a reprint in 1864. 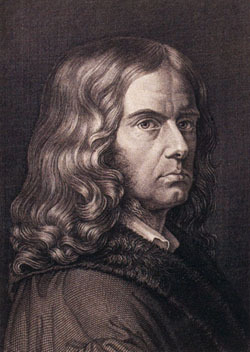 The German poet Adalbert von Chamisso (1781–1838) spoke Danish and translated several of Andersen’s poems into German at an early stage. They formed the basis for Robert Schumann’s and other German composers’ arrangements of Andersen’s texts. Clara Schumann gave various concerts in April 1842, including one at the Music Society in Copenhagen and in this connection met Andersen several times. He listened to her concerts and attended a dinner party together with her. Her programme was quite modern and included Beethoven’s sonatas and in particular a work by Chopin, but as yet she did not play her husband’s compositions.